A WTO luxury car ruling regarding a complaint the US had made against China found “no basis” for duties imposed by Beijing between 2011 and 2013. The United States described the ruling as “a significant victory”. China had imposed tariffs on imported vehicles, including those manufactured by Chrysler and General Motors, such as the Jeep Grand Cherokee, Buick Enclave, Cadillac Escalade and many others. The duties were added after the automakers were bailed out by the US government during the financial crisis; they were lifted in December 2013. According to the World Trade Organization (WTO), the tariffs were “improperly imposed”. Duties as high as 21.5% were slapped onto US-made sedans and SUVs (sports utility vehicles), claiming they had benefited unfairly from state subsidies and were being sold in China below market value, i.e. the US car industry was “dumping” cars in China. The ruling will heighten tensions between the world’s two largest economies after the US accused give five military Chinese personnel of stealing corporate secrets from a wide range of American companies, including those involved in clean-energy products, credit-card payment services, tires and chicken parts. According to China, its market was being flooded with cheap luxury cars, which harmed its own car industry. In 2012, the US filed a complaint with the WTO, which found that China failed to show how the imported cars harmed the Chinese market. The Geneva-based trade arbiter added that China did not inform the US carmakers on how the tariffs had been calculated. Exports of vehicles from the US grew by 48% last year to $8.6 billion. After Canada, China is the largest foreign market for US vehicle manufacturers. The US filed a separate complaint to the WTO in September, 2012, alleging that the Chinese government subsidized its own auto parts and vehicles. That case is still being reviews. This is the third recent victory for the US regarding alleged anti-dumping and anti-subsidy practices carried out by China. Previous ones were related to steel and poultry. 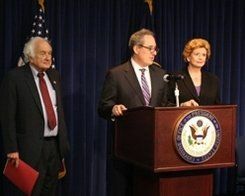 Senator Debbie Stabenow (D-MI) said the dispute is mainly about US jobs. She described the ruling as a major victory for US workers and carmakers and “another blow to China’s illegal trade practices. Senator Levin hopes there will be a renewed effort to open Chinese markets to US products and that the WTO will move swiftly to rule on the pending cases against China. After WTO rulings, the losing party tends to appeal the decision. Sometimes both parties appeal, with the winner seeking to endorse its position more strongly. Since joining the WTO in 2001, China has had a track record of appealing in nearly every ruling that goes against it.